The NA27 has a helpful feature that was sadly removed from the NA28 and that is a selection of subscriptions to the NT books. These often contain information about authorship and even the location of writing. In preparing to teach Hebrews, I noticed this particular subscriptio cited for minuscule 104. 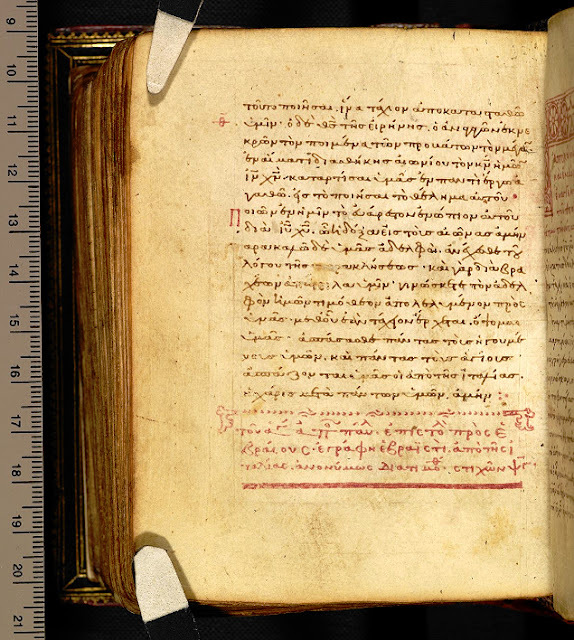 According to NA27, the subscriptio for Hebrews reads: πρ[ος] Ε[βραιους] εγ[ραφη] Εβραιστι απο της Ιτ[αλιας] ανονυμως δ[ια] Τιμ[οθεου], or “to the Hebrews, written in Hebrew from Italy anonymously through Timothy” (cf. Clement acc. Eusebius, Hist. Eccl. 6.14.2–4). A number of other manuscripts include the reference to Italy and to Timothy but, so far as the NA27 goes, only 104 adds that it was written in Hebrew and anonymously so. It’s that last part about anonymity that grabbed my attention and turned me to the manuscript. 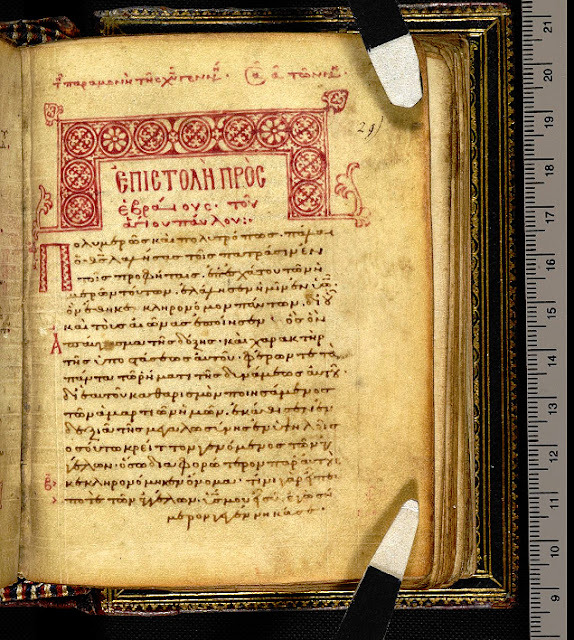 GA 104 is also known as BL Harley MS 5537 and, per the BL catalog, was copied by Ioannes Tzoutzounas (Ἰωάννης Τζουτζούσας), hieromonk of the Asekretis Monastery in Artanion, in May 1087. When I checked the images of the manuscript, however, I found to my surprise that Hebrews is anything but anonymous. On the first page of Hebrews, the book is clearly titled “Epistle to the Hebrews by the Apostle Paul (του αγιου Παυλου).” Turning to the end of the book, I found I wasn’t getting the whole story from the NA27 there either. Because the subscriptio also names Paul as the author. A couple of observations. The first may be obvious, but it is that the scribe’s own subscriptio requires that we clearly distinguish between the text and paratext of Hebrews. The rubrication and accompanying decoration do that too, of course. But it’s surprising to see that the subscriptio itself doesn’t make sense unless we keep that distinction firm. The text of Hebrews is ἀνωνύμως (without a name) whereas the very paratext that tells us this, just as clearly isn’t. Here the paratext is secondary—and must be read as such—otherwise it becomes self-contradictory. The second observation is that this description should expand our conception of “anonymity.” ἀνωνύμως does not mean here that the author of the book is unknown; it means only that his name is unstated in the book itself. I draw attention to this because when it comes to other books like the Gospels and their alleged anonymity, we should not conflate unnamed authorship (ἀνωνύμως) with unknown authorship. For more on that matter, see Simon Gathercole’s recent article in JTS. Beyond these two observations, I mostly thought it was a fun subscriptio and shows the unexpected things you learn when you go beyond the Nestle-Aland apparatus. A wonderful example of why Lexicons are continually updated and why commentaries, journal articles, and lectures should always be kept up to date! This is a very interesting example of how fun TC is.